On 12/18/04 participants, Andrew W, Linda H, Steve E, Kay M, Sarah R, Phillip L, Swee G, Rick S, Maria S, Eric L, Piero V, and myself met at the plowed out entrance of the DL Bliss State Park headquarters. Following our track, Lisa and Greg met us on the route. 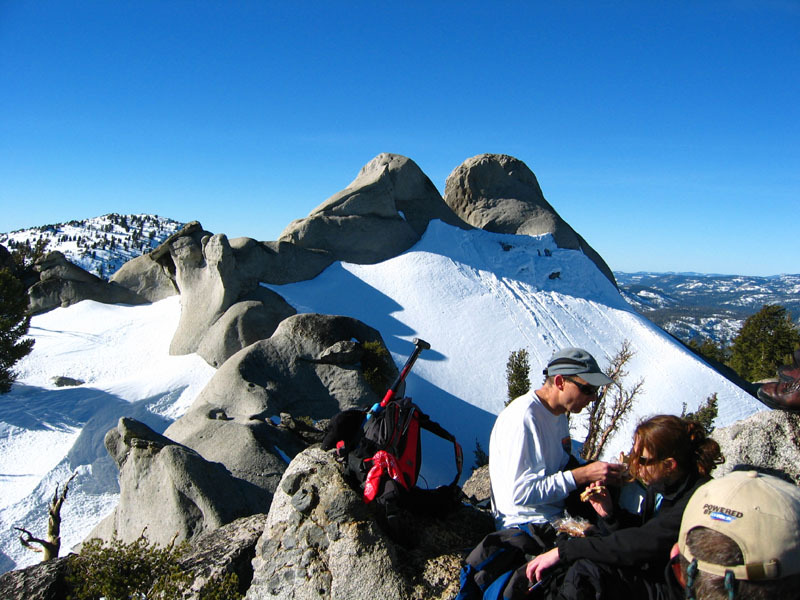 Our objective for the day was to ascend both Jakes and Rubicon Peaks on the eastern edge of Desolation Wilderness and west shore of Lake Tahoe. The Park headquarters is located north of Emerald Bay on Highway 89. We were fortunate in that there had not been any recent storms or Caltrans would have shutdown Hwy 89 at Emerald Bay for avalanche danger. This would have made access much more difficult. Once everyone had prepared their gear we had a short meeting and I handed out maps. We talked about the planned route and were underway at 9:15 AM. Expecting the snow to be a little more firm we attempted to hike on the snow north along Hwy 89, but after sinking in a few times we decided to snowshoe up. Once on our snowshoes we continued north then turned northwest into the woods and the up hill slope. At this point, the plan was to zigzag through the woods following the widest contour lines on the map. At about half way to the saddle Lisa and Greg caught up with us. According to the map there were two small fairly flat meadows on the route. We continued to climb, took short breaks in the meadows until we reached the saddle between the two peaks. There we had three participants sign out. Sarah, Phillip, and Swee would lunch at the saddle and enjoy the views of Lake Tahoe. We had to remove our snowshoes to get over the rocks at the saddle. Then once on the west slope we were able to shoe up again and start for Jakes Peak. This was one of the many times we had to remove our snowshoes because of rock obstructions. Heading southeast we continued the up and down of the ridge line until Jakes Peak was reached. Jakes itself has a class 4-5 summit block that was definitely a friction climb. So with wet boots, no rope and club policy we did not top out on the last 20 feet. So instead we all practiced a short glissade and climbed a neighboring unnamed peak and lunched on is summit. After lunch we began our trek northwest toward the saddle and then to Rubicon Peak. Since it was only four days from winter solstice we had to step it up so that we could get out before dark. We followed our same path to the saddle and regrouped. Here Rick had to sign out to make it in time for a family commitment. It was a fast return for him as he followed our ascent path. The rest of us continued toward our second goal of Rubicon Peak. We zigzagged through as many snow paths we could find, but had to remove our snowshoes many times before the peak was in view. Just after the saddle we met Sarah and saw Phillip and Swee below the ridge. Sarah wanted to climb Rubicon, but it was too far out for her to return and descend with Phillip and Swee before dark. So she turned back to guide them out. Continuing on our way we could see a unnamed peak but no Rubicon. Since it was Kay's birthday and Desolation is well known for naming peaks after people we decided to unofficially name this unnamed taller than Rubicon, Kays Peak. That way we had a way to refer to the peak for navigational purposes. Once passed Kays Peak we put our snowshoes on again. There were still plenty of rocks, but with all the snow and moats around the rocks it was like trying to navigate a mine field. We dropped to the saddle separating Kays and Rubicon Peaks. Then it was up 300 feet to the summit ridge. We took off our snowshoes and Eric, Andrew, Steve, Kay, Piero, and myself scaled the short class 2+ up on Rubicon's ridge. The ridge itself was about 5 feet wide and 50 feet long to the summit. It was about a 50 foot drop on the west and a 150 foot on the east. A no fall zone for sure. We sat there a short time, took in the views and took some photos. We made our way down the same as our ascent. 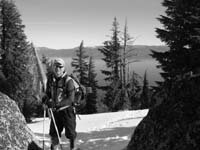 Hiking down to our snowshoes we rejoined the others and began our decent to the Rubicon-Kays peak saddle. Here we regrouped and talked about the descent strategy. The plan was to descend south east and traverse across so as to meet our original tracks up the mountain. However, this was not to be. Between the steeper slopes and obstacles along the way we continued a more easterly descent than a south easterly one. Some decided to glissade while others stayed on their feet. Some in the group found the long day, cold, and slope angle to be a challenge. This slowed the group down a little, but Steve took the sweep position and with that we were able to better stay together. We continued down and regrouped many times either at openings or after a steep section was complete. It was getting darker and colder. Most everyone put on more clothes, but were reminded to keep eating and drinking. We could hear and see the cars through the woods. Once out on the road we gathered at a pullout. It was 4:30 PM so those of us with headlights put them on. We walked another half hour and were back to the cars by 5:00 PM. The car thermometer showed 31 degrees. Later some of us went out for pizza and made our way home. All in all it was a successful trip, but a long one for such a short day. The trip had a overall gain of 3,100 feet. We started at 6,800' and topped out at 9,168'. Our total mileage was about 6, however, it was the terrain that made it seem longer. We entered at 9:15 AM and exited at 5:00 PM. This would be better done in the Spring with more daylight and less pressure to keep moving.